Each pack in Route 11's range has a different color, but none relate to the flavor. This is strange because it is so easy to do. This looks like a bad drawing of grass. The big and bold Route 11 logo is however very good. There is no need for it to dominate the bag - it isn't as important as the flavor. But when you are building a brand it is wise to make the most of what you have. We prefer constructive criticism though, so to help Route 11 along, every flavor should have a place name along Route 11 in their title. 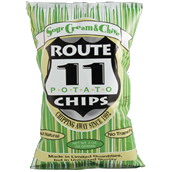 Unlike some of Route 11's Chips, these did not have as hard and firm a crunch. The oil bubbles smashed easily and although they were thickly cut Chips, the crunch was a little timid, although still better than average. These Chips varied from light pale yellow to a darker oily yellow. The oil bubbles festered away on a rugged surface; some large, some small and bumpy. There was some skin on a few Chip edges, plus some spotty seasoning and the odd fleck of green. These had less than a quarter of the sodium content of Route 11's Barbecue flavor. You really have to wonder why the Chip companies don't pay closer attention to these things. Chive is a fairly regular constituent of a Sour Cream dip, so the flavor should have been fairly familiar. However, it tasted a little oily potato mixed with sour cream and a relatively fresh flavor, that we would happily describe as Chive because we liked them!